These lights look exactly like the originals, but feature a state-of-the-art LED light that will not melt the lens like the originals did. The LED light is rated at 100,000 hours and will last for years. Our 67-68 Reminder Light comes complete with the OE under dash mounting bracket. The kit comes complete with a timer switch that will turn the light off after a short period of time! 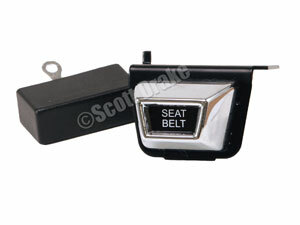 Also check out our Parking Brake Warning Light Kits (BK823), the perfect compliment to these Seat Belt Reminder Lights. Complete instructions included (see also under the "How To" section of our website).